Ninja Theory has invited several Devil May Cry veterans to try its controversial take on the series. The initial response to the Enslaved: Odyessy to the West and Heavenly Sword developer's semi-reboot of the DMC franchise was not particularly positive, to put it lightly. Fans didn't like the fact the series had been handed off to a relatively unproven western developer, they didn't like the fact the game would be running at 30FPS rather than the traditional 60 and they certainly didn't like the grittier redesigned Dante - whose uncanny resemblance to lead designer Tameem Antoniades has not gone unnoticed. Ninja Theory was initially dismissive of the fan skepticism, with Antoniades claiming the complainers "secretly wanted to like [the game]." Now it appears Ninja Theory is interested in fan feedback, at least from certain fans. According to NeoGAF, "top DMC players" in the UK have been invited to Ninja Theory's Cambridge Studio to try the game and hopefully offer some feedback. 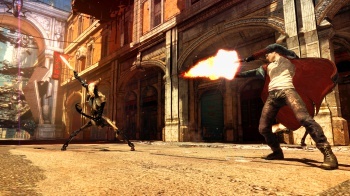 Previous DMC titles have had bustling communities dedicated to high-level player, and Devil May Cry 3, which is widely regarded as best game in the series, was developed with input from top-tier players. I wonder if this is a genuine request for player input, something Ninja Theory hasn't been particularly receptive to thus far, or if it's a PR move in the vein of Valve's method of dealing with Left 4 Dead 2 boycotters. Either way, the message I'm getting is that if you complain loud enough, developers will offer you a trip to their studio and free food. Begin whining.